Lucknow, April 16: Barely two hours after Union Home Minister Rajnath Singh filed his nomination papers with almost no rival in sight, Poonam Sinha, wife of actor-turned-politician Shatrughan Sinha, arrived here on Tuesday to take him on as a Samajwadi Party candidate. 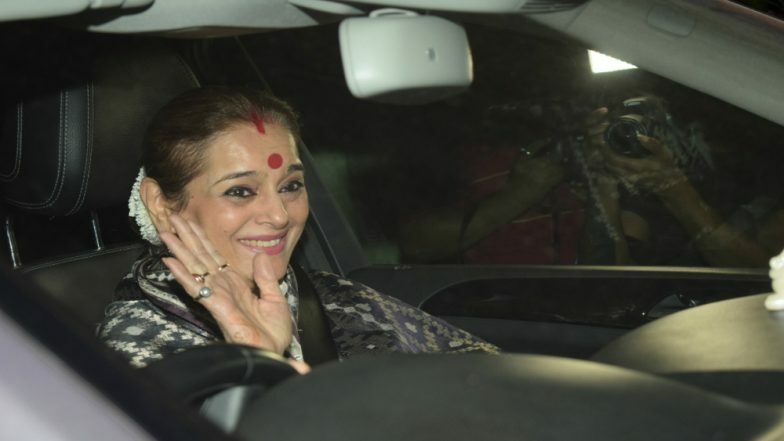 Poonam Sinha reached Lucknow earlier and headed straight to the Samajwadi Party office to formally become a member of the party. SP MP Dimple Yadav was present at the party office and gave the membership to Poonam Sinha. Later, Samajwadi Party founder Mulayam Singh Yadav also arrived at the party office and had a meeting with Poonam Sinha. Lok Sabha Elections 2019: Poonam Sinha to Contest Against Rajnath Singh in Lucknow. The Congress decision not to field any candidate from the state capital paves the way for a one-on-one face-off between Rajnath Singh and Poonam Sinha. There are four lakh Kayastha voters and 1.3 lakh Sindhi voters in Lucknow, apart from 3.5 lakh Muslims. Poonam Sinha is a Sindhi while her husband Shatrughan Sinha is a Kayastha.